If you don't eat eggs, you can still enjoy by keeping that part out. 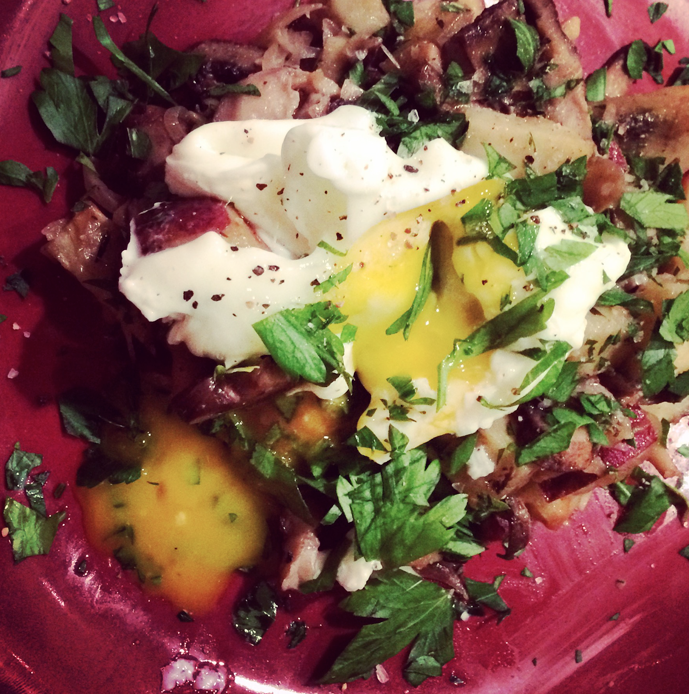 The wild mushrooms, potatoes and parsley are so flavorful together that you won't miss a thing. Of course, a poached egg on top will make this dish seducing. Dry saute garlic and add splash of vegetable broth. Add mushrooms, thyme, salt, pepper and wine and bring to a simmer. Add in potatoes, stir, and cover pan. Cook until potatoes are soften, about 15 - 20 minutes on medium/low heat. Stir occasionally. Once cooked, add parsley and serve with optional poached egg on top.